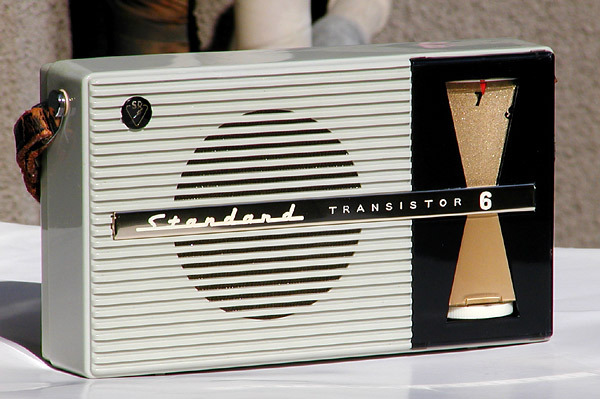 The SR-F32 is another high quality radio released by Standard around November 1957. While it may not be the smallest radio on the block, the stylish design doesn't feel bulky and the radio delivers a level of performance that was not attainable in a shirt pocket design. The 3-1/2" speaker and 100mW of distortion-free output belt out the tunes sharp and clear, and the four C-cell (UM-2) batteries that power it provide long life from a set of batteries. Besides, this baby came with about the best leather carrying case I've seen.